Pattern: Rolled Brim Chemo Cap, from Headhuggers. Notes: This is a beautifully soft yarn, and a simple and quick pattern. 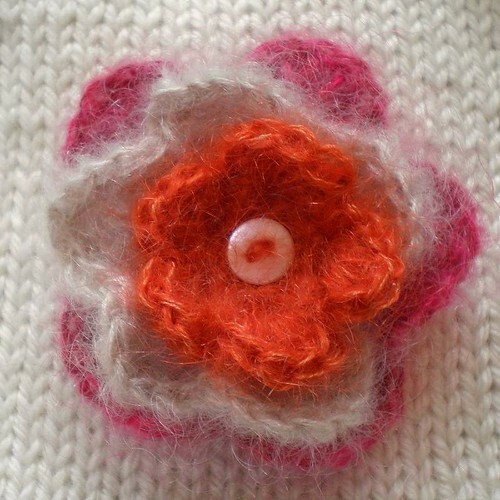 I improvised the flower using Kidsilk Haze and a crochet hook. 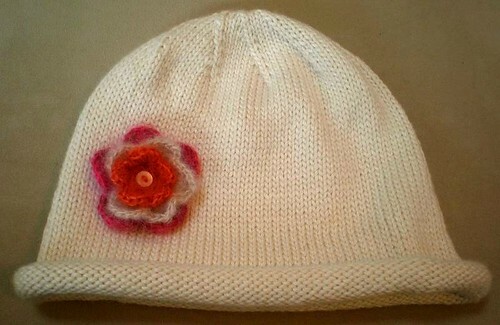 The flower is attached to the hat with a safety pin, so the recipient can remove it if she wishes. I chose these colours for the flower as the recipient is a redhead, so I thought they should suit her. What I learnt: I learnt that I am equally capable of producing uneven stocking stitch when working in the round as when knitting and purling… ho hum. 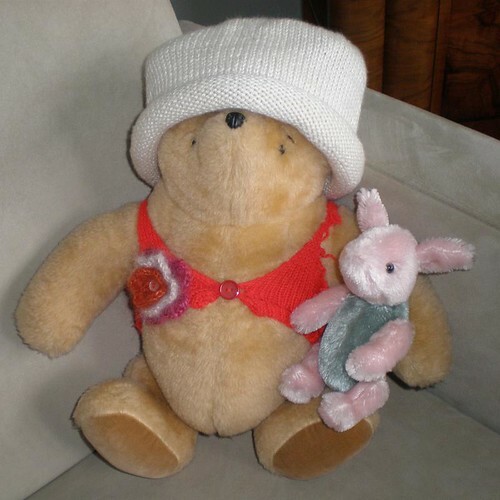 Anyway, here’s Winnie the Pooh, ably assisted by Piglet, demonstrating how the crochet flower could be worn as a corsage (how SATC of him!). I noticed while taking this photo that Pooh looks like he could use a new jacket. Another new project on the cards? 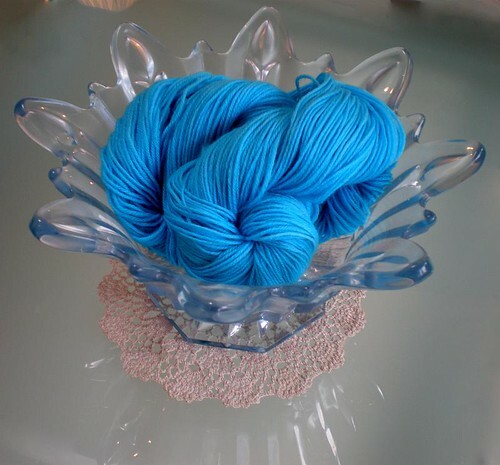 Recently I entered a contest on Laura’s blog, which she was holding to celebrate the inauguration of indieknits, her etsy shop selling her beautiful hand dyed yarn. I was thrilled to discover that I had won! Here’s the gorgeous sock yarn she sent me. I tried to take a close-up to show you the lovely, subtle variegated colour of this yarn, but have discovered yet another colour that my camera does not like. Ho hum – I know what’s going to be on my Christmas list this year! I’ve also just decided to make myself some long socks to wear under boots this winter. I really love Annie Modesit’s Silk Stockings, but that pattern only seems to be available in one of her books, and I don’t really want to spent £13 just for that one pattern. Instead I’m going to make Sooza‘s Lacy Cable Knee High Socks, except I’ll make them long enough to cover my knees (always a good policy I find!). Socktopus has some of the new Malabrigo sock yarn, so I’ve ordered myself some in the Alauncil colourway – if you’re on Ravelry you can see all of the scrummy colours here (scroll down to post 11) – mine is the one on the top right. 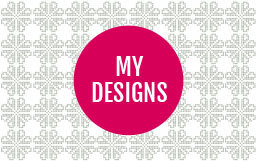 I’m really excited about starting this project! You might remember that back in April we painted our front room. The idea was to decorate and furnish it in a style compatible with the age of the house. Our home was built in 1924, so we thought that Art Deco colours and furniture should fit in beautifully. Well, one insolvent furniture company, and one less than impressive curtain and window seat supplier coughlauraashleycough later, we are slowly getting there. I’m planning to make a set of needlepoint cushions, but my enthusiasm for this project waned somewhat with the will-we-won’t-we-get-our-furniture-or-our-money-back shenanigans. This weekend Steve and I went to an Art Deco fair. We had bought a 1930s round walnut nest of tables from a supplier in Wigan, and had agreed to collect it from them at the fair. While we were there we also found a beautiful walnut domed display cabinet and, item of my fantasies, an Art Deco silver teapot set. 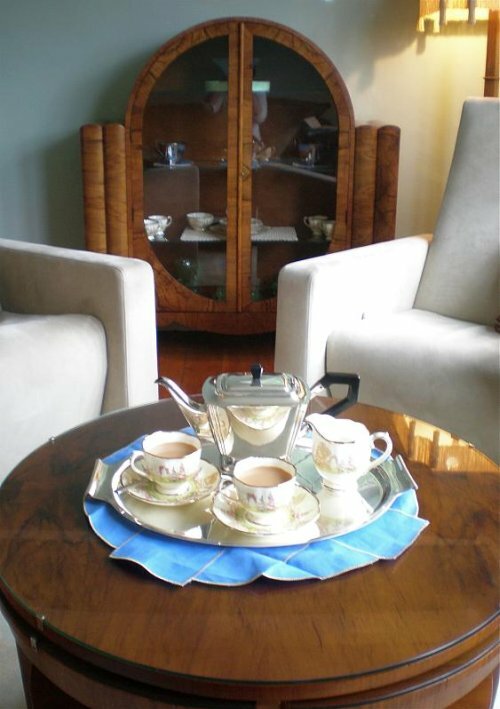 The silver milk jug and sugar bowl are just visible in the display cabinet above, along with the rest of the tea set. 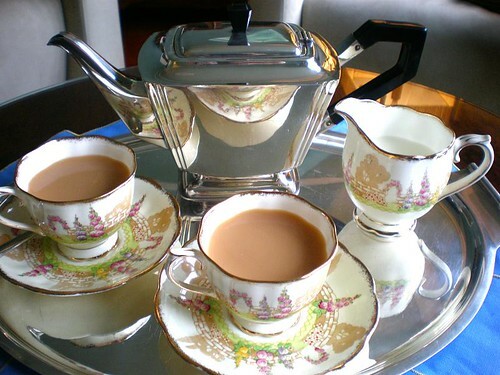 The tea set itself is a Royal Albert one from the 1930s – I particularly love the spires of hollyhocks and arches of roses. Yarn: Dream in Color Smooshy, in Visual Purple. Notes: Phew! I finished these during the closing ceremonies of the Olympics after a mad sprint to the finishing line on Saturday night and Sunday morning. I love how these socks look, but all the twisted rib has played havoc with my wrist; I don’t recommend this pattern if you, like me, have a tendency to get RSI. I also love this yarn and will definitely be using it again. What I learnt: A number of things. I learnt a new cast on method for single rib, which I’ll share soon. I learnt that knitting for a deadline is not for me, but that knitting something along with other people is. Yarn: Posh Yarn’s Eva 4 ply (50% cashmere 50% silk), 6 skeins knitted double. Notes: I loved making this cardigan. The yarn is sublime: soft, warm, subtly variegated and with a beautiful sheen. The pattern was quick and fun to make, and was the first top-down garment I have knitted. My Liesl isn’t blocked yet; I’m going to add a couple of inches to the sleeves as they have a tendency to ride up.